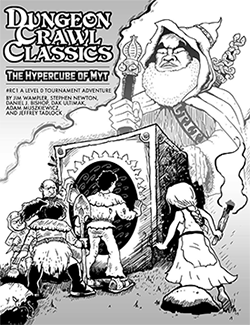 Chances are, you’ve heard a ton about the new Dungeon Crawl Classics Lankhmar material. In this episode of Spellburn, we will go through some of the crucial differences from DCC RPG, including steps for character generation and some of the basic things new players can expect in the setting. Whether you backed the Kickstarter, have already explored the City of a Thousand Score Smokes, have fully dipped your toes into the River Hlal (yuck! ), or are completely new to Fritz Leiber and his classic urban fantasy setting, we hope to uncover some of the mystery for you – in what is sure to be the first of a series of acclimating to DCC Lankhmar. Con on the Cob 2018! A very nice episode, and it was great to hear the old format dusted off and given some airtime. This was a great summation of some of the more overt changes in DCC Lankhmar (and I look forward to your discussion of patrons!). Michael Curtis really did hit this one out of the park! I am even more jazzed because….sooner or later, you fine judges will be doing this for The Dying Earth as well? Having a new Spellburn to listen to always makes my day! Phones on mute, please! I don’t stand for it at the table, definitely don’t want to hear it here. Is the Lankhmar setting only for Kickstarter backers or will Goodman Games be releasing this material on the store soonish? I expect that it will certainly be on sale to the general public, but no idea when. I’ve inquired with Judge Jen who sometimes communes more closely with the Dark Master. As always, such a successful KS is a blessing and a curse, what with the additional projects laid out within the stretch goals, etc… The final PDFs went out to backers on 1/17/19 and all the goodies (7 modules, huge map, special issue of the Goodman Games Gazette, and the 3-book box set) are currently at the printers’ for creation & assembly! Fingers crossed for smooth sailing from here!